I left home deciding against taking my DSLR because I didn’t want to care about it. Instead, I decided that on this trip I would use my iPhone and my old G9 as backup. Apparently feeling slighted by being third banana, my G9 camera made the decision to commit suicide at 70mph. I had no choice but to stand by or sit, as it were and watch in my side mirror as it’s little, black body bounced and spun on the roadway finally coming to rest on the shoulder. It was thoughtful enough to avoid being run over. Even if the camera were destroyed, I still wanted the memory card that was inside of it. So, I doubled back to pick it up. I didn’t know what I would find. It could have been gruesome. Instead, because my camera was dressed for the crash, it came away relatively unscathed and works just fine. I’m actually quite shocked! Cool; your G9 now has journalist cred. 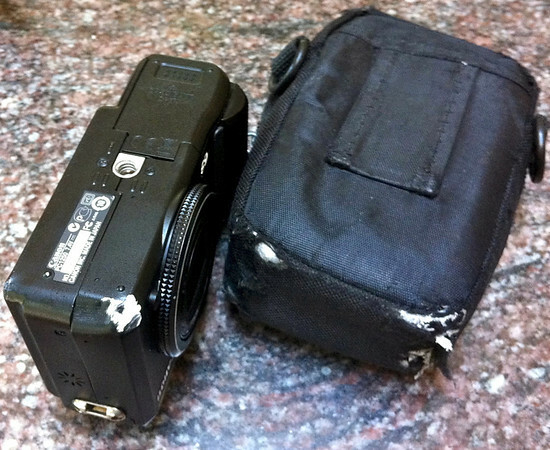 :^) What I want to know is just why the camera, still inside its case, bailed out in transit. Hmmmm? Why are you trying to make me divulge my own idiocy?! Only in the event it may educate the rest of us and possibly prevent similar incident. So, see, I’m only interested in the public service aspect of your story, not in any way for the possible comedic value. Nope. Because I’m not like that. Much. Well… it was tucked away safely inside my tankbag – which the camera somehow manage to unzip and leap free of the motorcycle all by itself. It was not being worn on my person messenger bag style and then the strap was not accidentally unbuckled while trying to zip the case closed. That would just be incredibly stupid. ATGATT! I forgot to zip my tail bag once and my favorite hat flew out onto old country rd I turned around and watched it get run over twice before I could get it. Glad to see the camera came out in 1 piece, i’m sure there are a lot of great pictures on it! Ha, what a great story. It is also the reason I really love my trusty old G7, it has seen me through all sorts of fun times. I will admit however bailing at 70 is admirable.